Natural stone tiles are classy, popular and available in various hues and styles. However, these tiles have both their good points and bad points. Read on to discover if stone tile flooring would be a good option for your home. The Pros – Natural stone tiles are unquestionably beautiful. They give a home a warm, pleasant ambiance and look good with just about any style of decor. What is more, natural stones tiles are eco-friendly, making them ideal for homeowners who are concerned about the environment. The Cons – Perhaps one of the main reasons why homeowners do not choose natural stone tiles is the high cost of purchase. Other drawbacks include the fact that some types of natural stone are brittle and can be easily scratched or chipped. Should damage occur, it could be difficult to rectify. 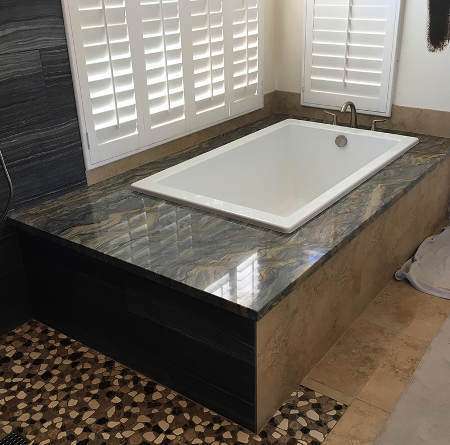 It is also important to note that some types of natural stone are porous and as such has to be regularly treated with a sealing agent to prevent water damage or staining. Is Natural Stone Right for You? There are many types of natural stone, including marble, slate, granite, travertine, limestone and sandstone. Each stone has its own unique properties, so consider the pros and cons of each one to know what type of natural stone, if any, is right for your home. Aesthetics such as color and style should be taken into account to ensure the stone looks good in the room where it is to be placed. Make sure the stone tiles do not have small flecks of iron as the iron can rust and leave reddish marks that are difficult, if not impossible, to remove. option for homeowners who have a limited budget and don’t mind a few minor defects. Whether or not natural stone flooring is right for your home is something only you can decide. While this type of flooring is currently popular and there are plenty of options to pick from, natural stone has its drawbacks and may require more care and maintenance than other types of flooring. Make sure you are able to afford good quality stone and are able to properly care for it to ensure that it enhances rather than detracts from your homes’ style.